Hiking the Falls Trail in Ricketts Glen State Park was at the top of my Pennsylvania bucket list for as long as I had one. So, when I was planning a trip to Northeastern Pennsylvania during the fall, I knew that a visit to Ricketts Glen was in order. 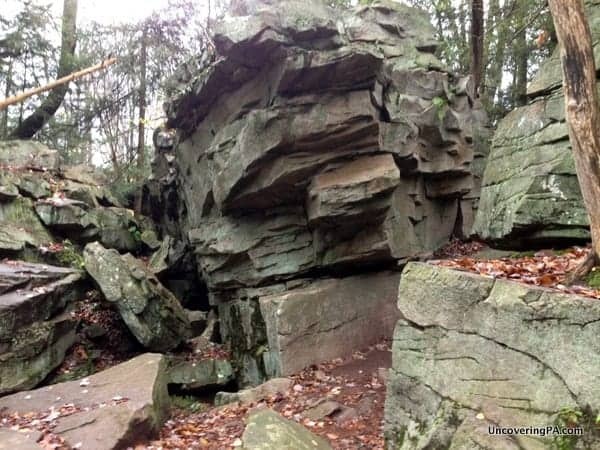 Ricketts Glen State Park is located mostly in Luzerne County, Pennsylvania, with small sections in Sullivan County and Columbia County. 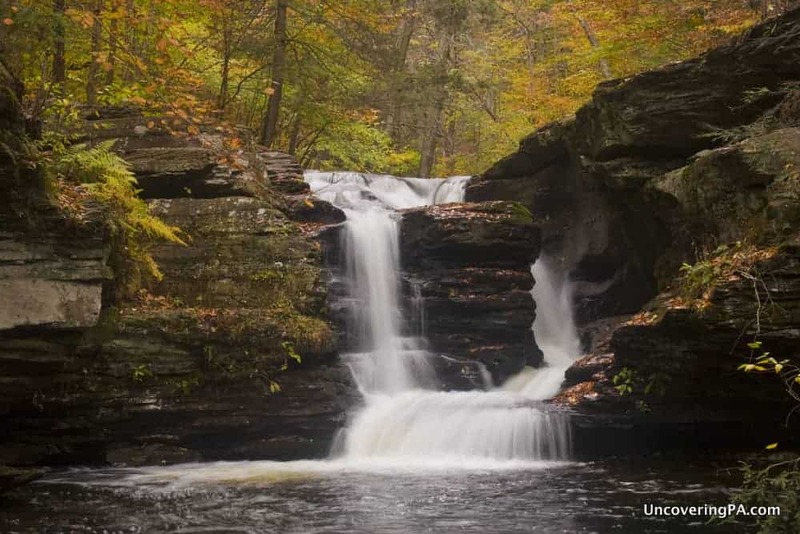 The park covers 13,000 acres of land and features 26 miles of Ricketts Glen hiking trails, two lakes, and a great camp ground. However, the highlight of the park is the Falls Trail. 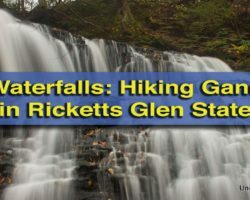 Featuring 21 waterfalls, the Falls Trail in Ricketts Glen State Park is one of the best hikes in all of Pennsylvania, and, as perhaps the best hike in Ricketts Glen, is the main reason many visit the park. The 7.2-mile trail has a reputation as being super difficult and dangerous. Truthfully, though, as long as you exercise common sense, the trail really isn’t that bad. I was a bit worried that my out-of-shape self would struggle with the trail, but I found it to be much easier than expected. Harrison Wright Falls in Ricketts Glen State Park. That being said, the trail does feature many steep drop offs, uneven stairs cut into the rocks, and slippery conditions when wet. Proper footwear is necessary when hiking the trail, in addition to the usual precautions when hiking anywhere. 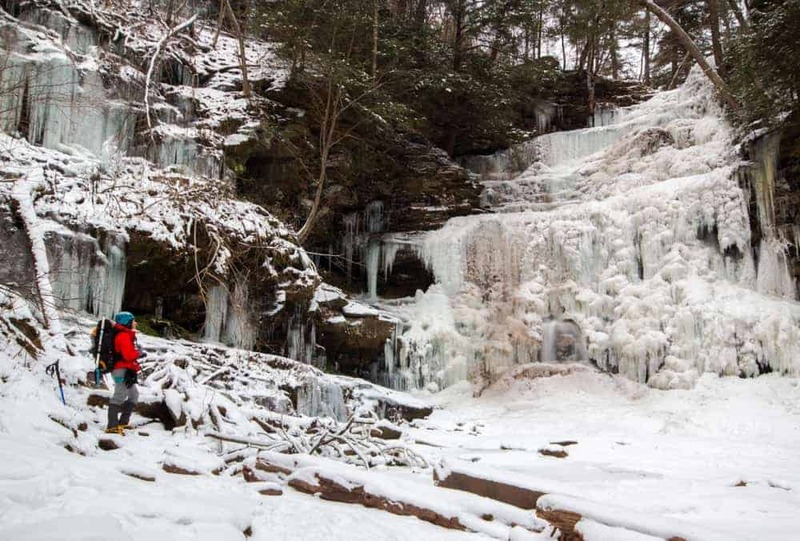 Winter hiking at Ricketts Glen is beautiful, but requires special equipment and experience. 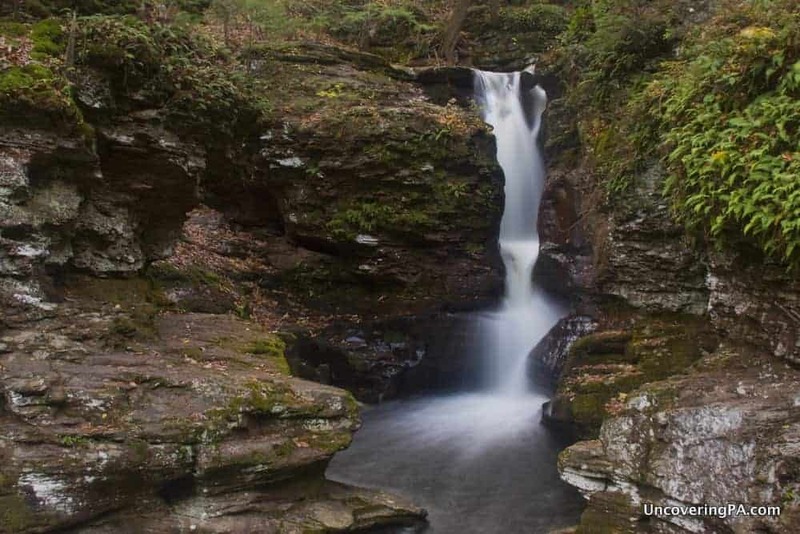 With 22 waterfalls in the Ricketts Glen State Park, it would be impossible to cover them all in one article. 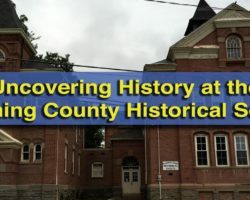 So, this is the first article in a four-part series. 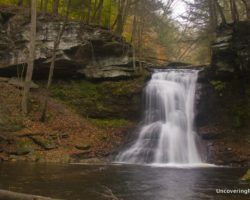 In this article, we’ll talk about a few tips for visiting the park, my recommendation for how to hike the trails, and other waterfalls in and near Ricketts Glen that are worth visiting. 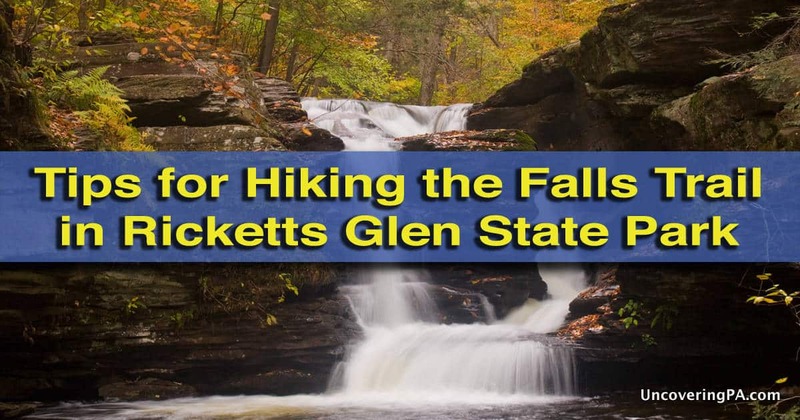 First off, the best time to hike the Falls Trail in Ricketts Glen is on weekdays when school is in session (April-May and September-October). If you visit during the summer, on a weekend, or, even worse, on a summer weekend, expect to share the trail with hundreds of other hikers. 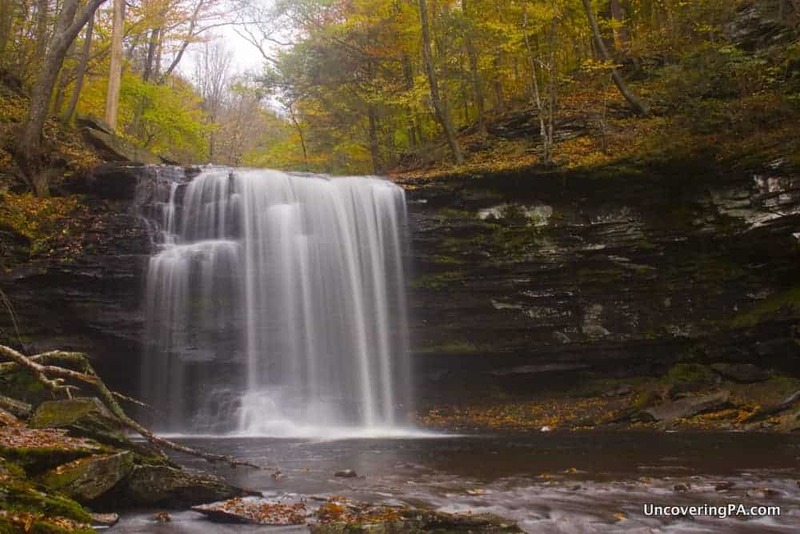 Shawnee Falls is one of the 21 waterfalls along the Falls Trail in Ricketts Glen. The traditional parking area for the Falls Trail is along Route 118. From here, the trail heads uphill past three waterfalls to an area known as Waters Meet, where the trail splits in two. Whichever way you go, there is a connector trail at the top, so you don’t have to come back down the way you came up. While this is the way that almost all visitors trek, I don’t believe that it’s the best choice for most. Instead, drive to the top of the glens and park at the Lake Rose Trailhead Parking Lot. Parking here will allow you to still see all 21 waterfalls along the Falls Trail while cutting off roughly 2.5 miles of hiking. After parking your car at the Lake Rose Trailhead, follow the trail at the bottom left of the lot. The beginning of the trail is a pleasant walk through the woods. After about 5 minutes of hiking, you’ll come to a trail split. Take the trail to the right and head into Ganoga Glen. While you could also go left and head over to Glen Leigh, Ganoga Glen seems like the better one to descend. Once you make the turn towards Ganoga Glen, the trail starts to get steep. You’ll come to the first waterfall, Mohawk Falls, within a few minutes. From here, you’ll pass the 10 waterfalls of Ganoga Glen within less than a mile of walking. In many ways, it doesn’t even feel like you are hiking, as the waterfalls are so close together that you’ll find yourself stopping every few minutes. It’s along this glen that you’ll find Ganoga Falls. At 94-feet tall, this is the tallest waterfall in the park and one of the tallest in Pennsylvania. 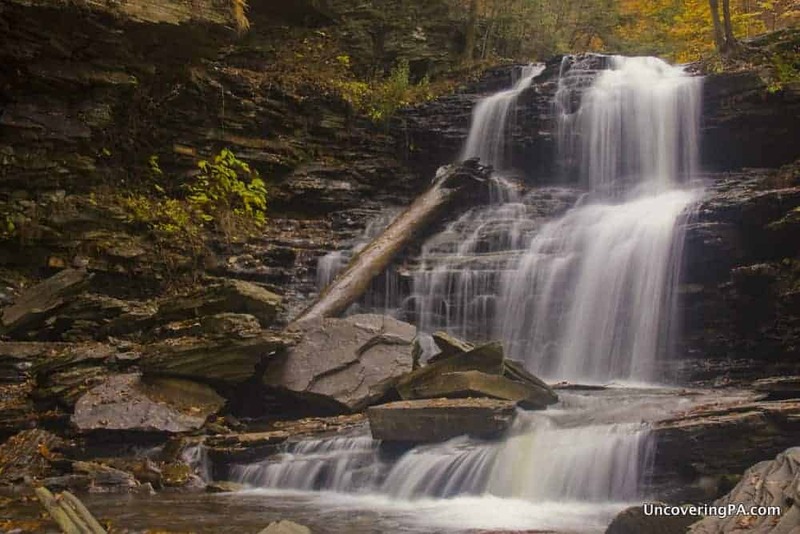 After passing the 10 waterfalls of Ganoga Glen, you’ll reach an area known as Waters Meet. It is here that the streams of Kitchen Creek meet. 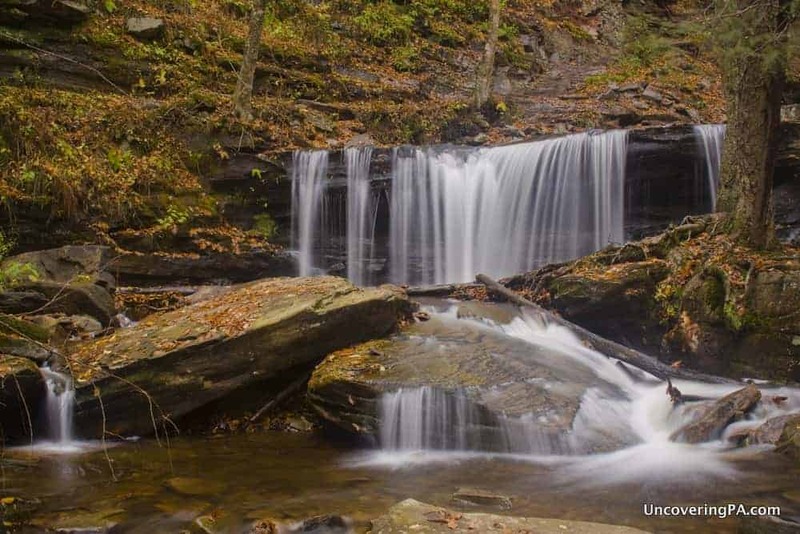 This is a great area to rest and just take in the beauty of Ricketts Glen State Park. A panoramic shot of Waters Meet. When you’re ready to go, you have two choices. If you cross the bridge, you can head up Glen Leigh. However, first, head downstream towards Route 118 because three of the park’s best waterfalls are within the first half mile of this trail. These three waterfalls are some of the most beautiful in the park and definitely should not be skipped. Once you’ve checked out these three waterfalls, head back upstream to Waters Meet, and cross the bridge to head up Glen Leigh. The path up Glen Leigh contains several bridges across the creek and alternates in a series of relatively flat sections and steep climbs around the waterfalls. Murray Reynolds Falls is one of three waterfalls below Waters Meet. On the mile-long trek up Glen Leigh, you’ll pass eight waterfalls, the tallest of which is the 60-foot Ozone Falls. I found the waterfalls of Glen Leigh to be a bit less dramatic than Ganoga Glen, but I’m really splitting hairs at this point as they are all very beautiful. After you’ve passed seven of the waterfalls in Glen Leigh, you’ll see a sign for a shortcut to the Highland Trail. Skip this trail because you’ll miss the small, but beautiful Onondaga Falls, while only saving about five minutes. Don’t take the shortcut and miss Onondaga Falls. Instead, pick up the Highland Trail from just above Onondaga Falls. The 1.2-mile long Highland Trail will take you back to your car and passes through the Midway Crevasse, a narrow opening in the rocks. The trail is fairly easy to follow, but make sure to bear right at the trail split, or you’ll find yourself heading back down Ganoga Glen. Midway Crevasse along the Highland Trail in Ricketts Glen State Park. After hiking the Falls Trail in Ricketts Glen State Park, you might think that you never want to see another waterfall again. 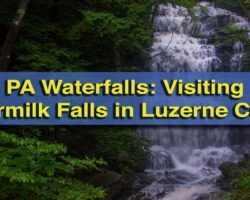 Suppress that thought, as there are four easy to reach waterfalls near Ricketts Glen that you should visit, as well as a few that are harder to see. The first two are located in State Game Lands 13, which is just across the road from the park. Heading down the narrow dirt road into the game lands, you’ll pass the roadside Big Run Falls before coming to a parking area. From here, it’s a short hike to the very, very impressive Sullivan Falls. Click the link for directions and information about visiting the waterfalls in State Game Lands 13. If you are looking for a challenge, you can also explore the other 20 or so waterfalls in State Game Lands 13. Start with a hike on Heberly Run to see three of the best. Sullivan Falls in State Game Lands 13 is a great waterfall to visit after Ricketts Glen. Either after visiting these waterfalls or instead of visiting them, head down towards Route 118. The one advantage of parking in the lots down here is that you are close to the other two waterfalls of Ricketts Glen State Park: Adams Falls and Kitchen Creek Falls. However, driving back down to see them is a better choice than hiking an extra 2.5 miles, in my opinion. Park at the Evergreen Parking area, near the kid-friendly Evergreen Trail in Ricketts Glen, and head just a few feet down the trail to see the very awesome Adams Falls. Many people I know consider this the best waterfall in the park, and it’s not to be missed. More information about visiting Adams Falls can be found here. 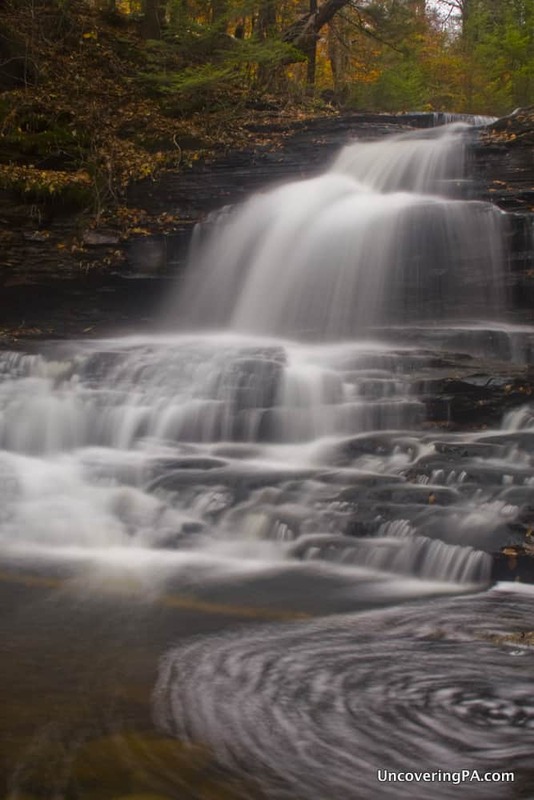 Many consider Adams Falls to be one of the best waterfalls in Ricketts Glen. The last waterfall in the park is Kitchen Creek Falls. This waterfall is not only the smallest waterfall in the park, but it’s also hidden under the road. However, if you want to see it, very carefully cross Route 118 and look under the bridge to see this surprisingly impressive waterfall. If you visit all the waterfalls listed here, you’ll be able to see 25 waterfalls in one amazing day that you won’t soon forget. 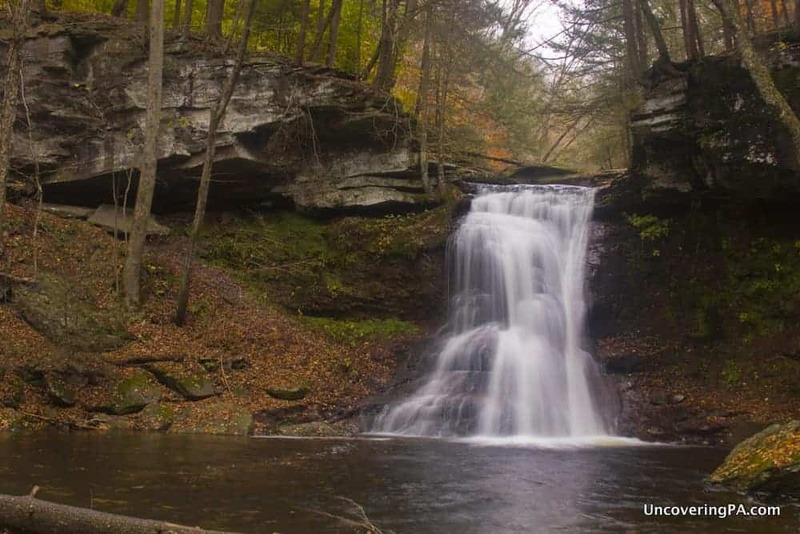 Want to see even more Pennsylvania waterfalls? 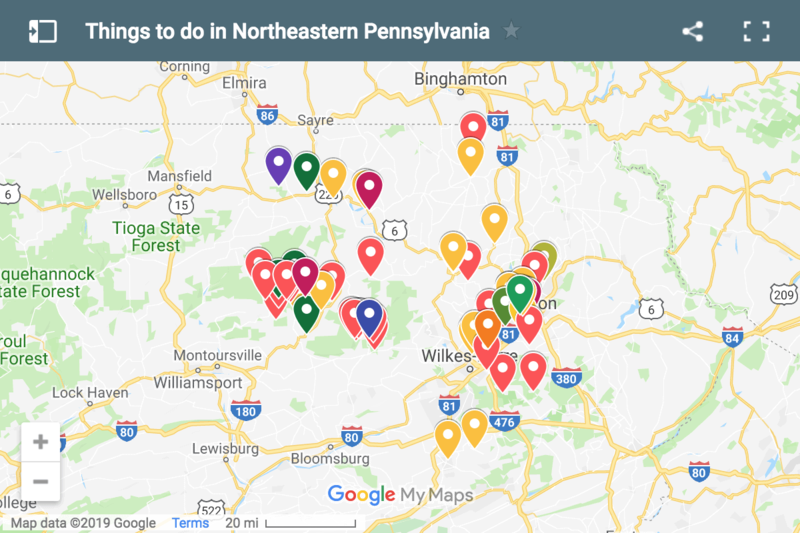 Visit our page full of the best waterfalls in PA! Excellent article! I really appreciate the detailed information, as I am planning a visit to the Park. Can’t wait for the other articles. Great shooting! Glad the article is helpful, Vivian. Enjoy your visit! 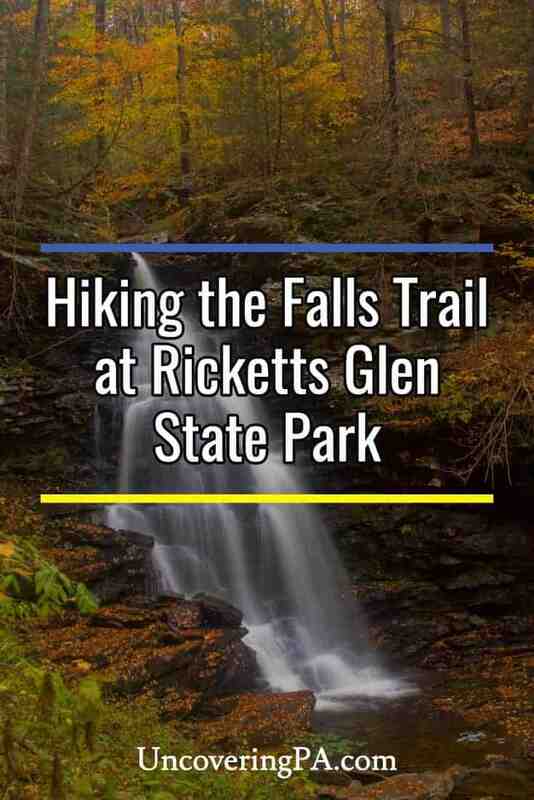 I love Ricketts Glen and I agree it never fully feels like a “hike” up a mountain would, because you are stopping so often to take in all the amazing waterfalls! I do agree that it gets very crowded during the summer weekends and the trails get log jammed at times! I can not agree enough and encourage people to wear the proper shoes to this park!! I have gone several times and have seen people going in wearing flip flops, sandals and yes even wedge heels!! It is really not safe to wear anything other than good boots or really sturdy, strong sneakers! On one visit we were just heading out and a rescue team was just headed in to get someone that had fallen! The trails/rocks get very wet and very slippery in places, but this hike is SO worth the trip!!!!! 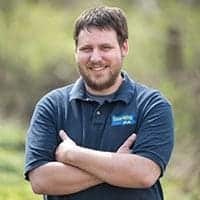 Good article, thanks for sharing! For those starting the hike at the Lake Rose parking lot, I always recommend going around the triangle in a clockwise direction, doing the HIghland Trail first. This makes it slightly downhill instead of slightly uphill. I’ve been suggesting to the park office that the unnamed waterfall off to the side near Delaware Fall be named for Ricketts’ wife; you may want to suggest this also. You may want to mention that on the short side trail below Ganoga fall, there’s typically a fallen log where you can sit and enjoy the fall. Murray Reynolds Fall is eminently (albeit illegally) jumpable from the cliff by the trail into the splash pool–providing, of course, that you first wade in and be sure there are no obstructions in the pool below. I’ve always called Kitchen Creek Fall the “How Not to Build a Highway” Fall. I’m very glad you’ve stressed Adams Fall, because far too many Glen hikers miss it. (I’ve asked the office to add it to the trail maps.) 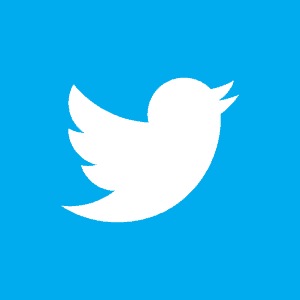 It is my favorite place in the world…. Good suggestions, Bill. I definitely wish they hadn’t built the highway over Kitchen Creek Falls. It’s a very cool one, but hard to see and nearly impossible to photograph. Definitely don’t want to recommend cliff jumping, however, as it is against the rules and very dangerous. I havent been to Rickets Glen for 20 years…. now 63 and would like to walk the falls. I walk 3-5 miles a day but it is not very hilly. Do you think it would be too dangerous or difficult for people with/without, lol, my ability? Loved your article, printed it out, if not for me, the others will be able to use it. The trail is challenging and quite steep, so if you can’t handle hills, it might be challenging. That being said, the abundance of waterfalls requires regular stopping. If you are in doubt, you could start from Route 118 and hike up to the first three waterfalls below Waters Meet. This is a fairly easy hike of a couple of miles. From there, you could go on to one or two more before the trail gets too strenuous. My friend and I will be in the area in mid September 2016 and are hoping to challenge ourselves with this hike. We are both over 50 but in decent condition even though we sit at a desk all day at work but are otherwise healthy. AS long as we have good walking/hiking shoes and take plenty of snacks and water, is there any reason we shouldn’t be able to complete this trail? Considering time for photos and snack breaks, how long should two over-50 women take to do this hike? I wouldn’t think there would be any reason you couldn’t do it. I found that I was stopping so often that I didn’t have the same issues of getting tired like I normally would on a trail of this degree. I’d plan on spending all of the day there. That way you can take your time and enjoy the place. Probably won’t take you all day, but best to have too much time than to have to rush. I have 3 boys; 3,7 and 8. Do you think they would be able to do this hike or would it be too steep for them? Thanks. Hard to say. It certainly would be very challenging for at least the 3 year old. Given the steep edges and sometimes slip trails, it might be somewhat of a risk to take kids that young unless they are very good at following directions and being careful. We did take a 3 year old, 7 and 8. They all did great, we carried 3 year old maybe 2 miles, when she needed a break in the backpack type carrier. But also all the the older boys go hiking with us on regular basis in Shenandoah, usually very steep 9-10 miles. So this trail was pretty easy compare to what we normally do with them. No climbing required. It was just a pleasant walk, and not a hard workout. We also saw many people not in really great shape on the trail. So I think your boys should do just fine. I went into this hike expecting to see a few waterfalls and then have to turn back because the kids would be tired or the trail would be too difficult (according to all the reviews I read), but my kids pleasantly surprised me and completed the entire 6 mile hike. It took us approximately 5 1/2 hours to complete, but there were so many things to see, places to stop off and eat lunch and snacks, and pooling water at the bottom of all the various falls to swim and play in that the time passed by quickly and easily. We obviously had to do a lot of helping and hand holding and it definitely wasn’t an easy trail, but we didn’t even have to put the twins on our shoulders until the very end. I think all the reviews making this trail sound next to impossible, treacherous, or not kid friendly were written by people who went here underprepared, didn’t have enough patience, didn’t use enough caution, or had a different mindset all together than me of what hiking should entail. If you haven’t been here I would highly recommend it! My five kids are 10, 8, 5, 2, and 2 (twins). I do think the trail gets a bad rap. If you wear proper footwear and take your time, it really isn’t that bad or that hard of a trail. Whether it’s good for younger kids probably depends a lot on how well they follow directions, but it’s certainly do able. Thank you so much for the article! It was fantastic over Columbus Day weekend! We were looking for something to do on our way back to Virginia following a trip to Niagara Falls. This even came after a visit to Watkins Glen in New York which we were told was the best of the Finger Lakes region. Despite all of those sites that are fantastic in their own rites…Ricketts Glen topped the list. UNFORGETTABLE! And thanks for pointing us there! Certainly one of the most beautiful trails anywhere! Make no mistake it can be difficult and dangerous, especially if wet or cold. I hike this trail at least 2 x’s a year. Suggest you allow plenty of time . Rest often and take in the view at various falls. Take water and a snack or lunch. If you start at the top(lake), your return will be uphill . You will not be as fresh as opposed to starting at the bottom(rt118). Also by starting at the bottom you are getting a better view of the falls. There are no quick exits to this trail. However, in many portions there are less demanding parallel side trails. There are no bathrooms along the trail, unfortunately. I can not wait to hike Ricketts, are the trails marked so we will not get lost lol ? Is it safe for my 13 year and 18 year olds to hike? The trails are very easy to follow. Only one trail through each glen. Most teenagers are fine for the hike as long as they aren’t careless with ledges. Just a thanks as I am so glad I found this post. We just hiked the trail over the weekend for the first time. We followed this trail plan and it worked out perfectly. Glad the article was helpful and that you enjoyed your visit. Just visited Ricketts Glen on a Monday, in July , after a major rainstorm. It was incredible. The whole route had raging rapids racing toward each waterfall. 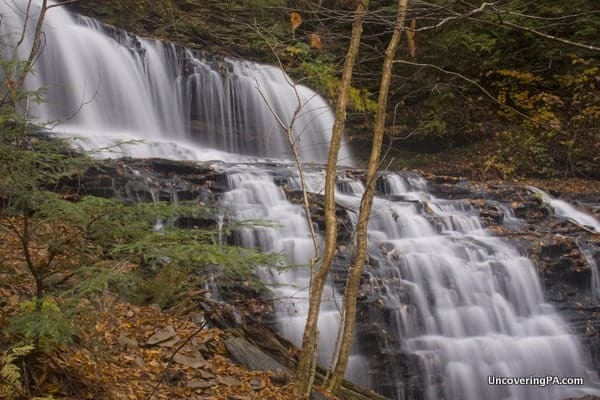 We love hiking and photographing the falls at Ricketts Glenn. Walking poles are very helpful on the trail, especially on the steep and uneven stone steps. I like having two poles to help keep my balance. Snacks, water and lunch are always good to have. Also allow plenty of time and start early enough in the day. Thank you for the article, we have missed seeing some of the falls, will be sure to check them out next time. I suggest bring a walking stick to take some stress of the knees when going back up. This is a beautiful hike. Walking sticks & hiking boots helped a lot. Looking at all the sneakers and yoga pants, we thought we were overdresssed, but Im glad we prepared. Surprisingly I oouldn’t find anything in the park materials that tells how long each leg is, so your article helped. I did half of it years ago then out to the road as my hiking buddy wasnt going to make the uphill climb. One different tip, going across the top and down Glen Leigh, then hiking back up Ganoga Glen (which is steeper) affords the benefit of facing the most beautiful falls rather than turning around to see them, plus hiking UP the steeper side is better/safer/easier….than going DOWN it. The park recommended that or I may have done the opposite. I’ve done it both ways, and I honestly think it’s easier going the way I suggested. There’s actually more elevation gain in a shorter distance in Glen Lehigh, but it’s in short bursts instead of a continual elevation change, which is why I think it’s easier to go up that way (short uphill sections instead of a constant uphill). As for facing the falls, you have to go down one side, so I don’t see that as being a significant issue, especially since there are more waterfalls in Glen Lehigh. Either way, there’s not really a wrong direction to hike it, and it all boils down to personal preference.